There are edits and there are edits. This book was first published in England in 1982. It came out with a word count of 55,000 words. The problem was the manuscript was 93,000 words. Now THAT's an edit. Fortunately Oconee Spirit Press has now published the full version in a very natty trade paperback. Since we all know most of my synopses are terrible let me as usual I'll let the press release do the heavy lifting. 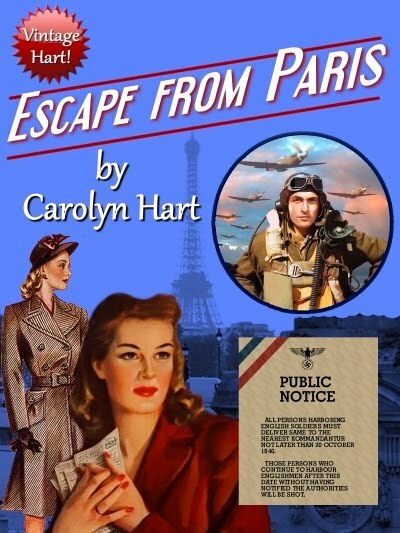 I'm so glad you featured ESCAPE from PARIS. I'm a huge fan of Carolyn Hart and this book is terrific. The characters--as always--are wonderfully drawn, the plot is full of white-knuckle suspense and I love the themes of resilience and courage.It's a fascinating book and deserves wide coverage. Jack O'Connell's Novels now available on e-books!